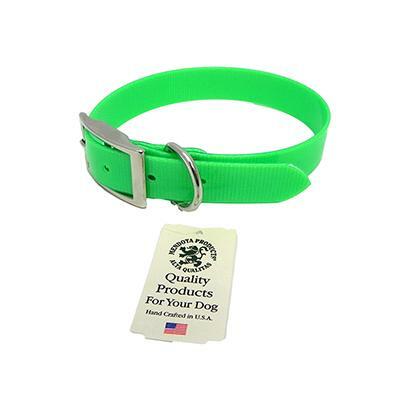 Made by Mendota pet products, this collar offers excellent durability without sacrificing affordability. Manufactured from Biothane, a polyester webbing with a PVC coating, these collars are extremely pliable in all weather conditions and are easily cleaned. Bright, fluorescent, day-glo colors help with visibility in darker areas. This product is perfect for an owner looking for a collar that will not retain unpleasant smells associated with wet, dirty, stinky dogs!! Choose a Mendotta collar; we are sure you and your dog will be pleased. 20 inch collar. Will fit neck sizes 20 to 22 inches. Price is for one collar.